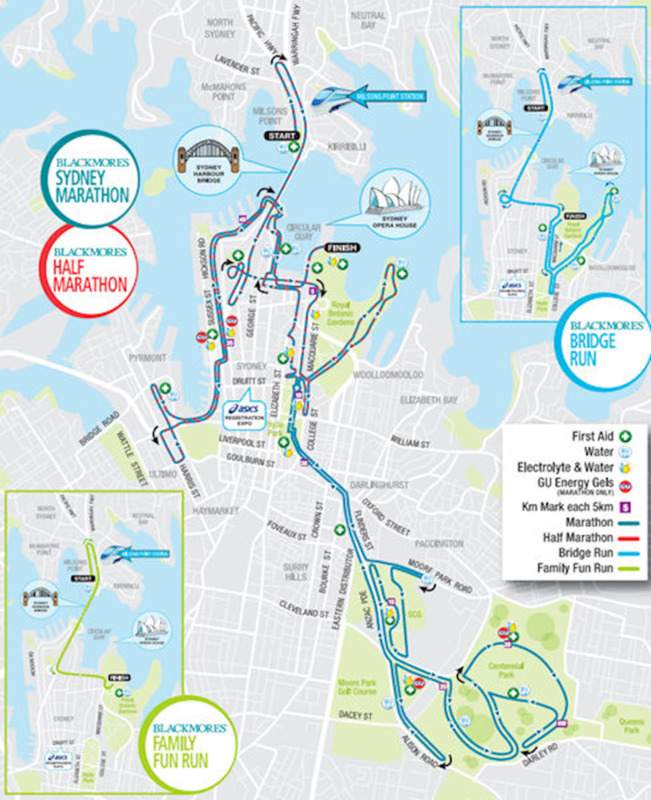 Run one of the world's most scenic marathon courses, taking in some of Sydney's most spectacular and historic landmarks including the Harbour Bridge and Opera House, This is Blackmores Sydney Marathon! !Blackmores Sydney Running Festival is held in Sydney, Australia. The event was started in 2001, by the name “Sydney Marathon” and was organized as a celebration of the 2000 Sydney Olympics. Many events were added in the next few years and in 2005, it was renamed as “Sydney Running Festival”.There are various events conducted on the same day for runners of different age to suit their interests. While running, the runners can see some of Sydney’s most spectacular and historic landmarks including the Harbour Bridge and Opera House. A designated marathon only refreshment station will be located after the finish line. An additional drink station will be located in the Recovery Village. Entrants must be a minimum of 18 years of age to enter the Marathon. Entrants must be a minimum of 16 years of age on event day to participate in the Half Marathon. Drink stations will be found throughout all courses except the Blackmores Family Fun Run and at the finish line for all entrants. At each drink station there will be water. Portable toilets can be found at every drink station. Finisher T-shirt and quality commemorative medal featuring an Australian Athletic Legend. Marathon overall cut-off time 6hrs:00mins. Half Marathon overall cut-off time 2hrs:45min. Both Blackmores Half Marathon and Blackmores Sydney Marathon participants will have access to IsoWhey Sport the Official Electrolyte drink at some drink stations (indicated on the course maps). GU Gels are only available for Sydney Marathon participants at selected drinks station. The results are based on Gun Time as per the IAAF (International Association of Athletics Federations) rule 165 part 24 (below). The Blackmores Sydney Running Festival is run under these rules because its results can be used for selection into International and Olympic events. However, net times are also provided for participants who would like to know the true (net) time it took for them to run from the start line to the finish line. This is provided for personal use only. I really like the Sydney Marathon. It's fairly small for a city race, but that's good because you can make a good time and not be crammed in at the start. The race starts underneath the bridge and t... I really like the Sydney Marathon. It's fairly small for a city race, but that's good because you can make a good time and not be crammed in at the start. The race starts underneath the bridge and then you cross the harbour and head south. Good vibe. The course does some unusual loops and switchbacks down at the centenial (?) park before coming back up to the city and winding in and out all those little bays around Darling Harbour before finishing at the Opera House. I found the course to be very good and it currently has my PB. I will do it again for sure. It's not dead flat, but none of the hills are very steep. Because it's a smallish race I think it's a good one for PB hunting. Even though I am a Victorian, I prefer this course over Melbourne. Blackmores Sydney Marathon and the Half Marathon course: flatter, faster and even more beautiful. Run one of the world's most scenic marathon courses, taking in some of Sydney's most spectacular and historic landmarks including the Harbour Bridge and Opera House. Then the runners pass through Arthur St Tunnel, Bradfield Highway, Sydney Harbour Bridge, Cahill Expressway, Western Distributor, Corkscrew tunnel, Sydney Hospital, Art Gallery Road, Mrs Macquaries Road, Boy Charlton Pool, Hyde Park, Archibald Fountain, Pool of Reflection, Anzac Memorial, Moore Park Road, Driver Ave, STA Bus Lane, Anzac Parade, Grand Dr, Queen’s Square, Museum of Contemporary Art, Campbell’s Cove and finishes at the roadway into Sydney Opera House. Start at Bradfield Park, Milson's Point travel over the main deck of the Sydney Harbour Bridge and finish at the Sydney Opera House. Introduced in 2001, the Sydney Marathon followed the same course as the marathon during the 2000 Summer Olympics the previous year. During that first year, the women's race was won by Krishna Stanton, who had never run a marathon before, and was doing the event as a result of a challenge from a friend.